Warner Bros. Interactive Entertainment, TT Games and The LEGO Group today announced LEGO Dimensions, an all-new entertainment experience that merges physical LEGO brick building with interactive console gameplay. Launching September 27th, the game will fuse many fan-favorite universes together, including DC Comics, The Lord of the Rings, The LEGO Movie, The Wizard of Oz, LEGO Ninjago, Back to the Future, and many more still to be announced. LEGO Dimensions will be available for Xbox One and Xbox 360, PlayStation 4 and PlayStation 3, and Wii U. For the first time in any LEGO videogame, characters from iconic entertainment franchises join forces and battle in worlds outside of their own. 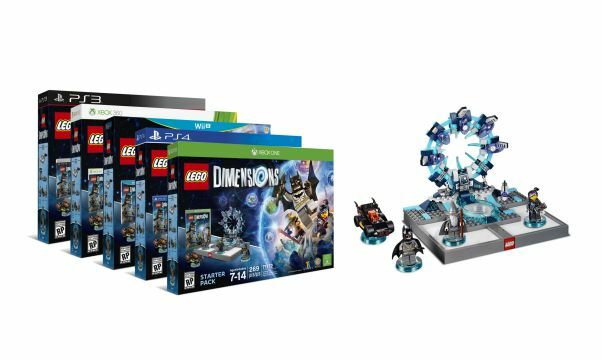 In addition to the game, the LEGO Dimensions Starter Pack will include the LEGO Toy Pad, which allows players to transport special LEGO minifigures and other LEGO objects into the game, bricks to build the LEGO Gateway, three LEGO Minifigures, including LEGO Batman from DC Comics, LEGO Gandalf from The Lord of the Rings and Wyldstyle from The LEGO Movie, plus the LEGO Batmobile. In addition to the three minifigure heroes used to start the experience, LEGO Dimensions will allow gamers to customize their experience with additional expansion packs. Level Packs, Team Packs and Fun Packs will provide new buildable characters, vehicles, tools and gadgets, as well as game content with new mission-based levels and unique in-game abilities. All expansion packs will feature well-known properties and provide gamers the opportunity to use everything interchangeably, anywhere throughout the game – with no limitations.